The first day of this short session has been curiously lop-sided. We began with worship, and then paid attention to the real world outside. Archbishop Warda, Archbishop of the Chaldean diocese of Erbil, spoke softly and movingly about the horrendous time being endured by Christians in Iraq. Refugees, ruined or deserted churches, persecution in many ways… He pleaded for prayer and practical action, was heard in silence, and followed by thunderous applause – our best way of showing sympathy and affection. Read his address here. Synod heavyweight, Tim Allen from St Edmundsbury and Ipswich, made a trenchant attack on the way this is being handled, naming both Archbishops as responsible for preventing Synod from examining the report – and pointing up the embarrassment of having chosen Lord Green to chair the group that did the work. (This week’s papers have had an intense focus on Lord Green – see, for example, today’s Guardian.) There was a good joke about ‘closing the Wash House door’, too (The Wash House is the bit of Lambeth Palace that houses the Appointments Advisers, responsible for implementing the Report.) I had to get my Synod clapometer out, which is pretty rare during a debate on the agenda, which tends usually to only bring out Synod bores (like me). and did not allow proper scrutiny or debate. Someone sharply pointed out that good leadership and talent in the Church was not exclusively clerical and episcopal. Clapometer on overload again…. Another speaker complained (politely) that we were being discouraged from putting amendments to the motions about the Task Groups – and that anyway, the deadline for submitting them was is before the groups do any discussion. I think people are feeling railroaded. The Business Committee got given a hard time over this mess. Sue Booys, the Chair, took a lot of flak. But in her reply to the debate, I thought I picked up a bit of a coded message (or slip of the tongue, as the case may be) that they felt obliged to do things this way. Presumably the pressure from the Archbishops and the Church House big chiefs was hard to resist. But it hasn’t gone down well. Archbishop Justin’s Presidential Address began defensively. He had a spoof piece of management–speak which I guess he hoped would defuse the situation. But it did not go down well, and – despite the theme of ‘witness and evangelism’, including a reflection on 2 Corinthians 5 and references to his world church visits, – the whole thing felt very flat. One experienced Synod hand from a shire county diocese said to me afterwards “They [the Archbishops] just don’t get how angry people are about the process. People feel brushed aside and ignored”. The printed text reads much better than it sounded at the time (if you see what I mean) – check it out here. He gave a characteristically clear presentation of some of the Church’s problems: declining numbers of regular worshippers and clergy; very skewed ago-profile of church members (we are terribly old compared to the population at large. Very simple graphs, very cogent analysis. Good stuff. Bishop Steven Croft explained the background to the Task Groups working on resourcing ministerial education (GS1979). Interestingly, he has had to put out a ‘clarification’ of what the proposals really mean – read it here .Projections of clergy numbers future look depressing (Mind you, they have done so since I was ordained in 1979). But the aspiration now is to achieve 50% increase in ordinations in the year from 2020 onwards. That is what cricket commentators call a ‘big ask’. It has financial consequences, and suggests a major shake-up of the present arrangements for theological colleges and courses. John Spence then came back to talk about resourcing (GS1978). The current formulae for sharing clergy numbers and finances around the country, with a bias to poorer dioceses, no longer work. We need something new. The Group want to move to a new flexible approach that gives priority to poorer areas, but also looks for intentionality in mission by those wanting the funds. And it needs to happen sooner, rather than later. By now Synod was a bit tired and listless. The Bishop of Ely had the short straw – explaining the work covering the development of leadership (aka the Green report GS1982). He admitted that communication should have been better. He pulled back on some of the controversial language (e.g. ‘MBA’ courses), while stating clearly that our senior leaders do need proper help to carry their responsibilities. He agreed that lay leadership mattered – but spoke almost entirely about clerical leadership. It’s about being spiritual and practical. Lord Green was neither present, nor mentioned. The closing two presentations began with Andreas Whittam Smith looking at the finances of it all (GS1981). If we take Church Commissioners funds to pay for these things, we are borrowing from the future: so must be done only very carefully… He only wants to put Commissioners finds in if we are in a crisis (we are) and under safeguards (about which he will tell us tomorrow). And finally, Bishop Steven Croft talked us through the small groups on discipleship tomorrow morning. Then followed a jolly Q&A time. Tim Allen returned to the microphone to ask again why the Green report is not actually down for debate, unlike everything else. Some applause for that. But the Bishop of Ely wasn’t really able to do much except defend the report and the spending, and say senior appointments are an Archbishops’ responsibility, not Synod’s. He was heard in uncomfortable silence. the length of time it takes to get young people through the ordination discernment and training process: by the time they are ordained they are no longer young! What about the other end of the ordination journey: are we looking at why so many people leave ministry early? A change of Canon Law went through easily, and gladdened my heart. We agreed last year that the rules about who can distribute the sacrament of holy communion should be changed. ( I spoke about this in November 2012 and July last year). The impetus for this came from the diocese of Southwell and Nottingham, who wanted children to be able to do this in a school eucharist setting. But in making that possible, it was necessary to amend Canon Law. Woohoo – big stuff. Well, yes and no. The actual change is simply a matter of rephrasing the existing Canon to say that the authorisation can be given ‘in accordance with [regulations]’ instead of the existing wording ‘by the Bishop acting under [regulations]’. In other words, this frees us to make new regulations which don’t require the Bishop to be involved in authorising the people who assist in this way. At a later stage we will prepare the new regulations – expect some fiddly debate about at what level it should be done – Archdeacon? Rural Dean? – and in what way children will be authorised. But (selfishly) the good news is it will free Bishops’ offices (I work in one, remember) from a lot of very routine admin and paperwork. Hooray! The changing cultural climate we now live in. So the time may be ripe for reform and renewal. But the lop-sidedness of today is all about the way those Reports have come to Synod. Four are well worth debate and offer the prospect of real reforms to tackle the Church’s pressing problems. But the debates are skewed by the fifth – the Green report: its contents, the process (and its lead author) are raising a lot of questions. 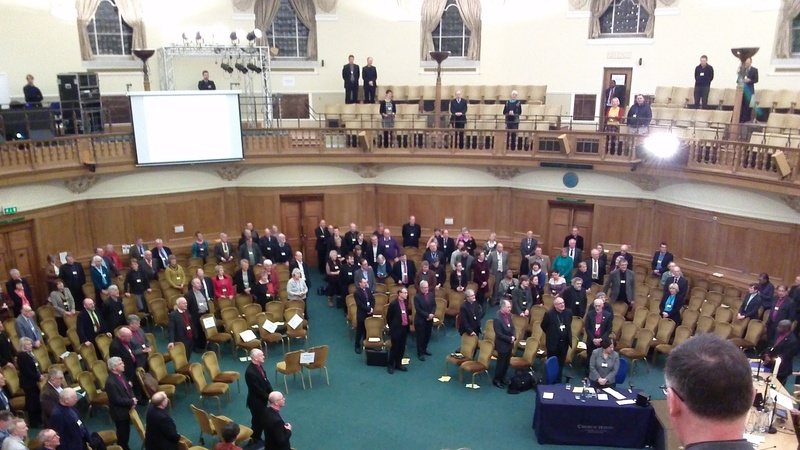 This entry was posted in 2015: July - York, General Synod and tagged Church Commissioners, Church of England, General Synod, Green report, Task Group. Bookmark the permalink. I am intrigued by the Archbishops reluctance to call to cut the £100 stake of high street gaming machines which target the vulnerable in areas of social and economic deprivation . Archbishop Justin is often asked to make statements on a wide range of issues and people write asking him to promote a public debate on a topic that is of particular concern to them personally. He hopes that you will understand however that it must be for him to decide when and what subjects he supports publically.